Hey rugby world! Thank you thank you for making our first year a memorable one. Thanks to ruggers everywhere we were able to donate over $4,000 to charitable causes! We kicked off the year with Vegas 7s, then headed off to USA Rugby camp, Club 7s, Super Series, and countless tournaments with Rugby Athletic. We helped Scotland #8, Jade Konkel, donate some much needed supplies to Rugby Uganda. We stopped thru Chicago to see the USA Eagles v. Maori All Blacks and the historic Ireland win v. the All Blacks. We sent some swag over to France with the USA Women's Eagles for their fall tour. 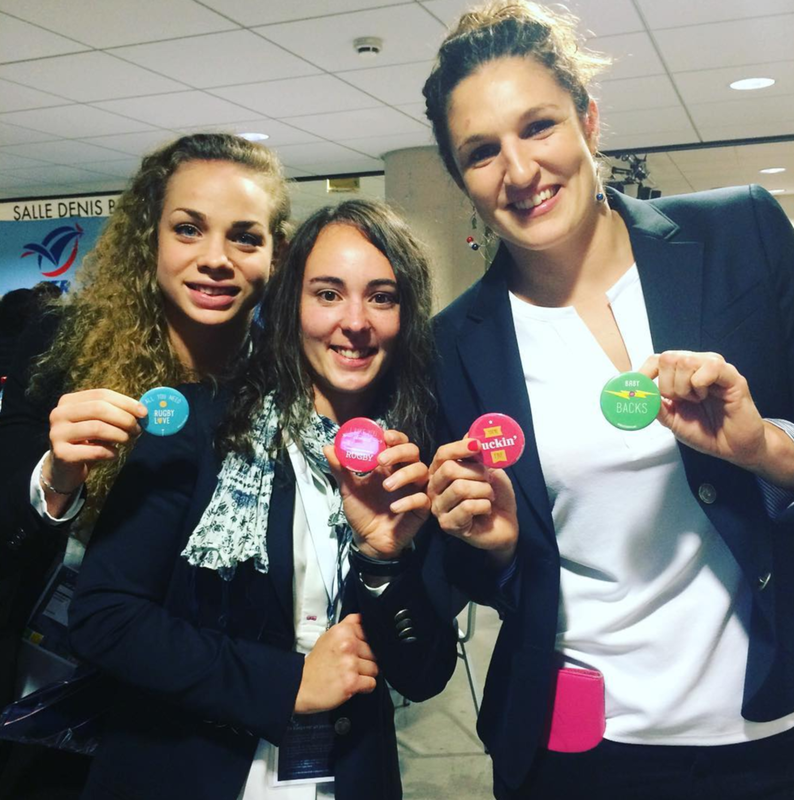 Here's the French scrumhalf, lock, and wing reppin' some buttons. USA Eagle flyhalf Kimber Rozier gave us an autographed mini poster of advertisements for their match. How awesome is it that her face was all over France? We love you all, thank you again for a great year! Here's to more big things for rugby in 2017! Yesterday, the inaugural rugby 7s Olympic tournament ended with the Australian Women claiming the gold, New Zealand taking silver, and our North American neighbors, Canada, coming in with the bronze. Even though the USA didn't make the podium, our hearts are exploding with pride and love 'cause they played out of their minds tying World Champion and Olympic gold winners, Australia, and holding powerhouse New Zealand to only 5 points. What's even better is that all these awesome athletes have now inspired a brand new generation of ruggers. Thank you for playing with heart, grit, and class and for showing the world the game we love! Now time to cheer on our Men's Eagles! Go USA! We had an excellent time at the 2016 Women's Rugby Super Series. Thank you to First 15 Sports Performance for having us! All four teams (England, Canada, France, USA) showed true class and an impressive level of competition. Although the USA didn't get the outcomes they wanted they showed moments of brilliance, athleticism, and grit. Plenty of promise and a solid foundation as they build toward the 2017 World Cup. We believe that the best way to fight hate is with love. Full-on, unyielding, pure-of-heart love. So, that's why we're asking the rugby community to help us send some love into the universe through this campaign. For every "love" our fundraising post gets on Facebook, we'll donate a dollar to a worthy cause. Money will be split between an organization that supports LGBTQ youth (tbd) and Play Rugby USA, which fosters positive values, sportsmanship, and inclusion through rugby. In addition, due to requests, we'll be turning this design into a t-shirt which will raise money for the two organizations mentioned above. For our on-the-ground effort, one of our PRL team members will be attending vigils in Orlando and giving out "more love, less hate" buttons to show our support for the LBGTQ and rugby communities. Please contact us at projectrugbylove@gmail.com if you'd like to get in touch with them. Thanks in advance to everyone who has supported this campaign and the Orlando community.